Essentially, this dish is a partially fried partially braised noodle dish. Hence some of the star ingredients like prawns, squid and belly pork would have to be precooked as they are only added in during the braising step! The fresh king prawns, with the veins and shells removed. 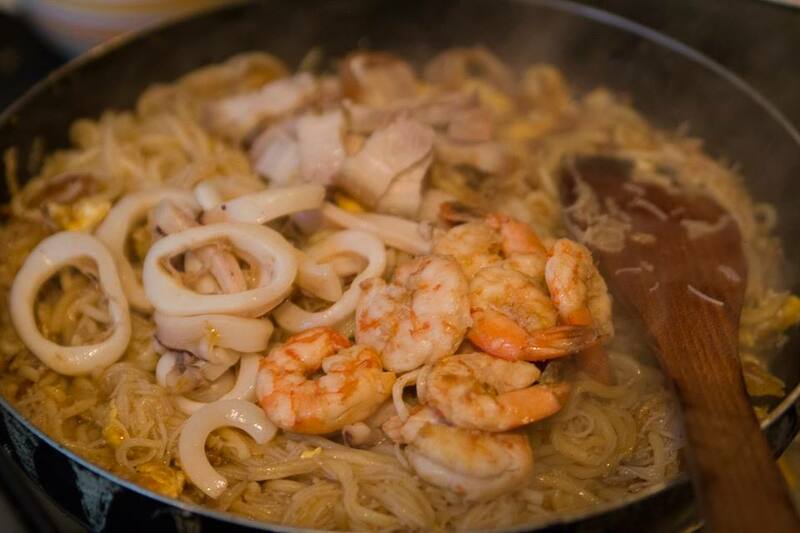 Although prawn lovers argue that shells should normally be kept on because they would have a nicer bouncy texture, shelled prawns are definitely easier to eat in a plate of fried noodles! 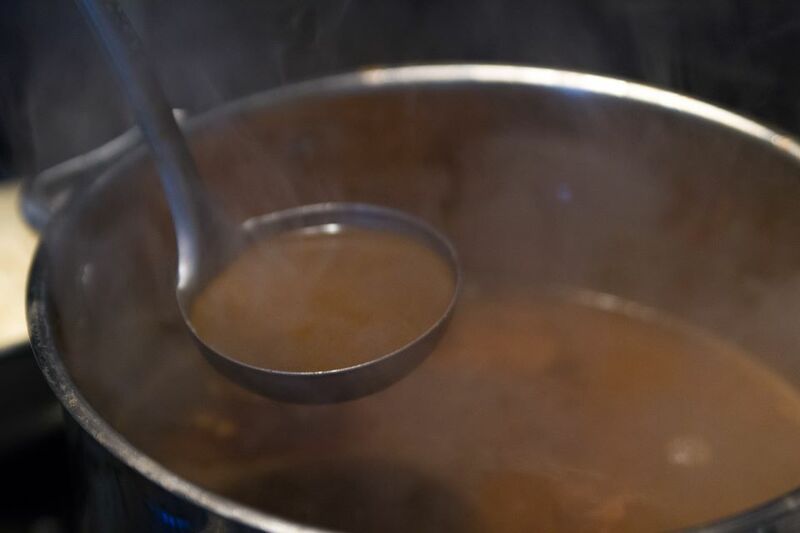 Prawns are normally cooked in boiling hot water but we chose to cook them in our pot of boiling soup stock to further enhance the sweetness of our stock (purely optional haha). Cook till 60-70% cooked as they would be further cooked later when the noodles are fried and braised. 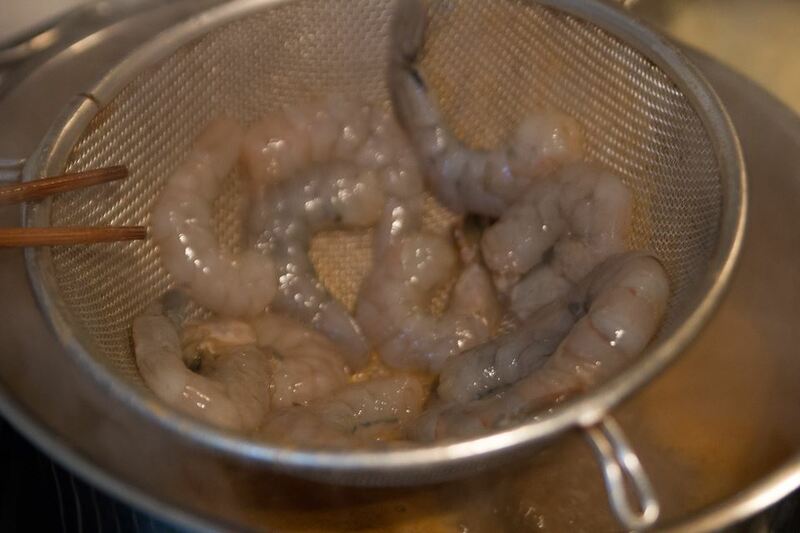 If the frying will not be done immediately after this step, store the prawns in the fridge when they are cool. Seafood turns bad easily when left in the open air for long! This was half of a fresh whole squid that weighed 1.2kg! Wash and remove the quill (clear bone) and insides thoroughly. Do you know the difference between squid and cuttlefish? Besides the fact that squid tend to be longer and narrower while cuttlefish are more rounded in shape, squid, or sotong (joke: also a Singaporean/Malaysian term for a person who is supposed to be muddle headed), has a quill, a transparent clear bone that resembles a piece of clear plastic. Cut into rings or thin slices. Cook till 50% done. It should still be soft to the touch. Squid is too easy to be overcooked so it is all right for it to be undercooked at this point as further cooking would be done when the noodles are being fried and braised later. 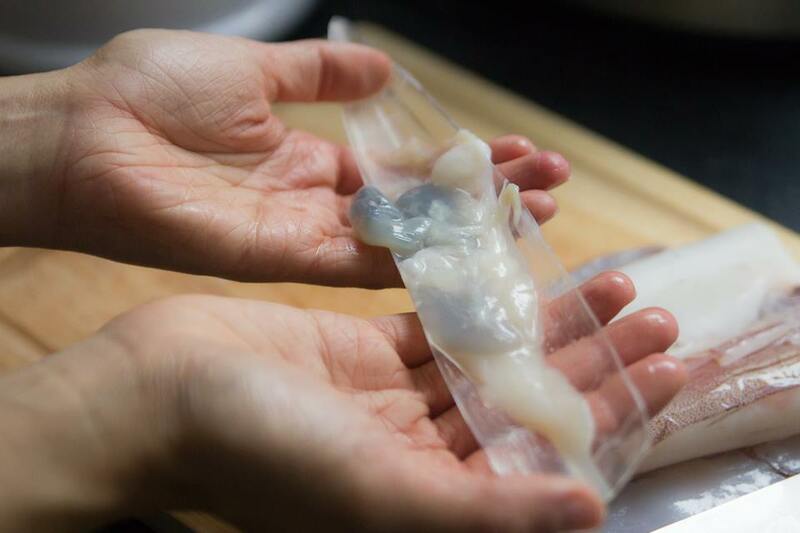 Like the prawns, store squid rings in fridge when cool until the noodles are to be fried and braised later! 3 slabs of very beautiful belly pork! This is the only ingredient that should be cooked thoroughly, as belly pork usually does not become overcooked easily! Cut into little chunks of fatty belly pork! 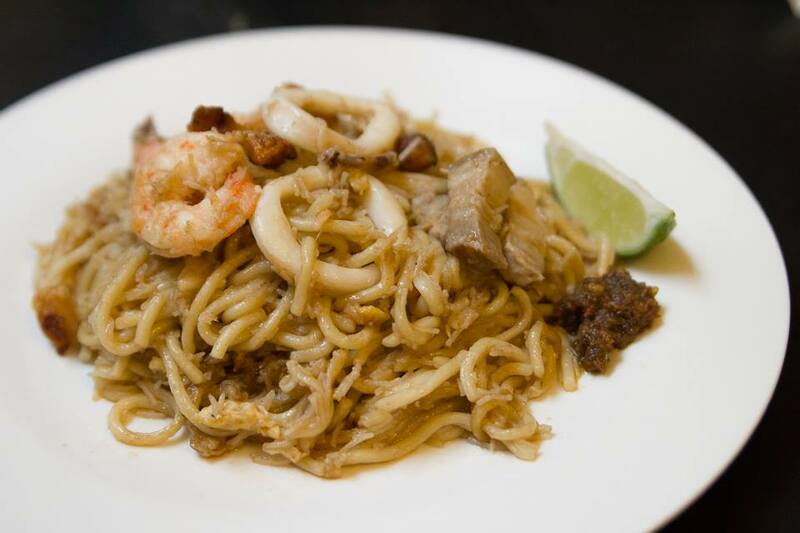 Don’t gag, the fat is exactly what makes Hokkien Mee so irresistible! ;D Store in fridge when cool as well. 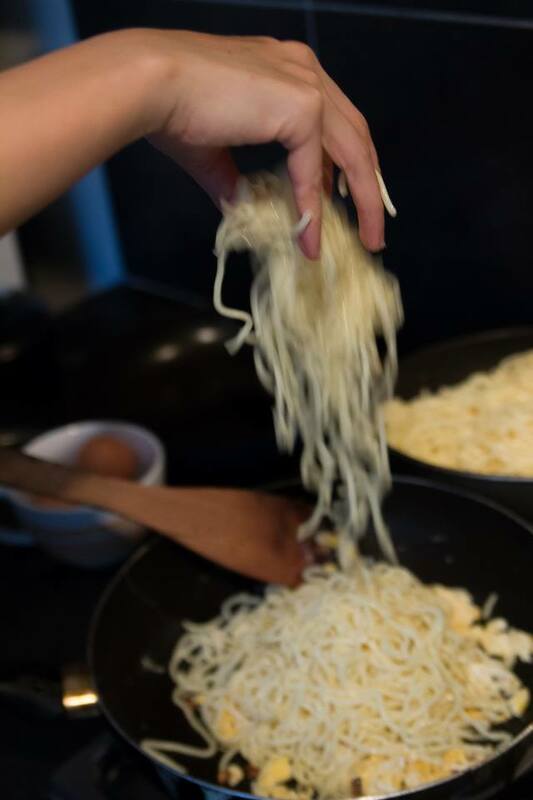 After frying the minced garlic in cooking oil till fragrant at medium heat (sorry there is no photo of this step), throw in the beaten eggs and whisk lightly in the wok until about almost cooked, but still soft. Throwing in the noodles and rice vermicelli with my bare (clean) hands like a true blue hawker! Hah! 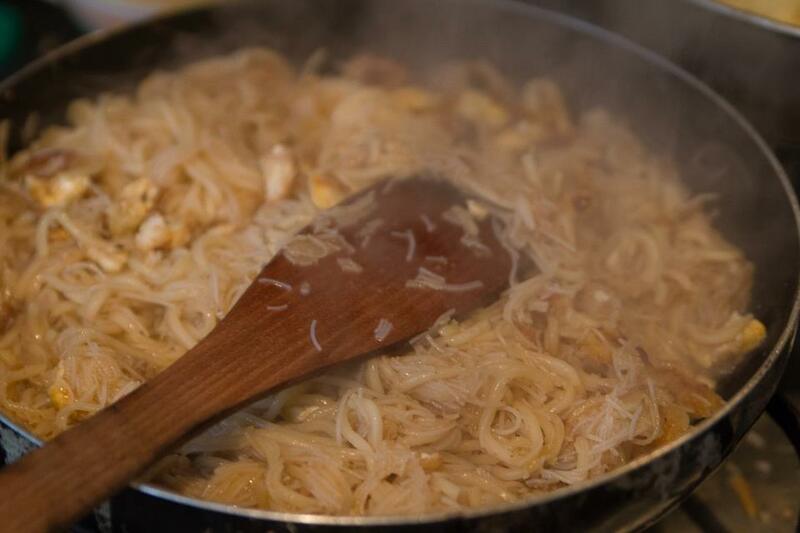 You may throw in the rice vermicelli later if you’re using the thin variety as they might become soggy too early if you throw it in together with the yellow noodles. At this step, add more cooking oil to coat the noodles if you desire. 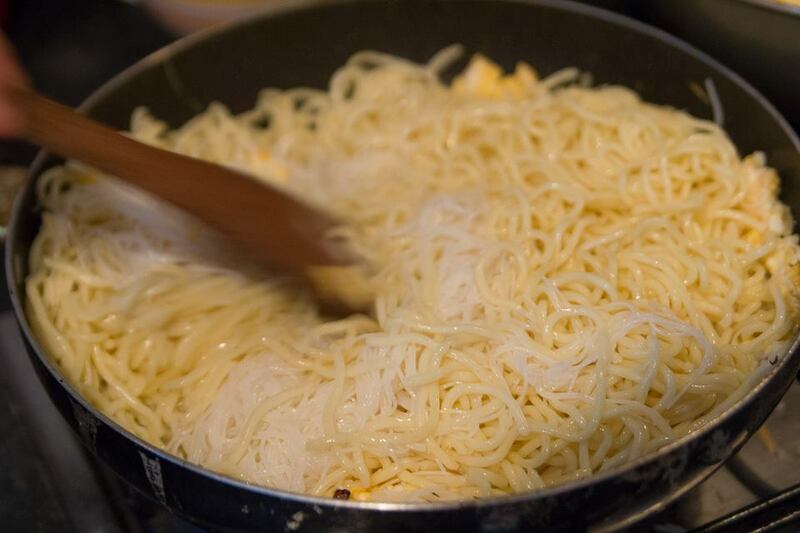 Turn up to high heat and fry noodles for at least 5-10 minutes until fragrant. Noodles should be al-dente still! Time to braise the noodles with some awesome soup stock. I went for a very laissez-faire approach and wasn’t too precise here, but there should be minimally 500ml of soup stock for a wok of noodles meant for 3-4 portions. A good soup stock is very important for great tasting noodles. 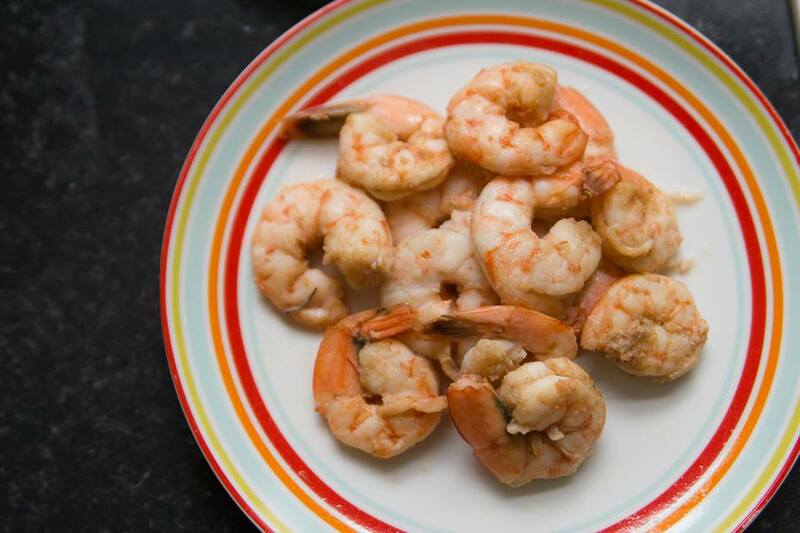 Some other recipes ask for a very simple soup stock made in 30 minutes (for instance, prawn heads and shells are merely simmered for half an hour). I figure that might be the reason why many food courts serve up Hokkien Mee that look a little too white and clean (just look at how darkly coloured the above soup stock is, after simmering for more than 24 hours). It is best to use a good homemade stock if you can! Otherwise, chicken stock might also be an adequate replacement but the flavour of prawns in the noodles would definitely not be as intense. Step 3: Garnish and serve! Note: I mentioned how soup stock is probably the key to getting a good Hokkien Mee, but who has the time to make soup stock for days on a regular basis right… (Not to mention that I actually smelled like prawns for 3 days straight while making these T_T”) Hence I decided to reduce the soup stock into a concentrated version, ala homemade Knorr stock cubes, frozen in the freezer, so that I will be able to fry up my Hokkien Mee whenever I want to in the future! Taken on my iPhone! 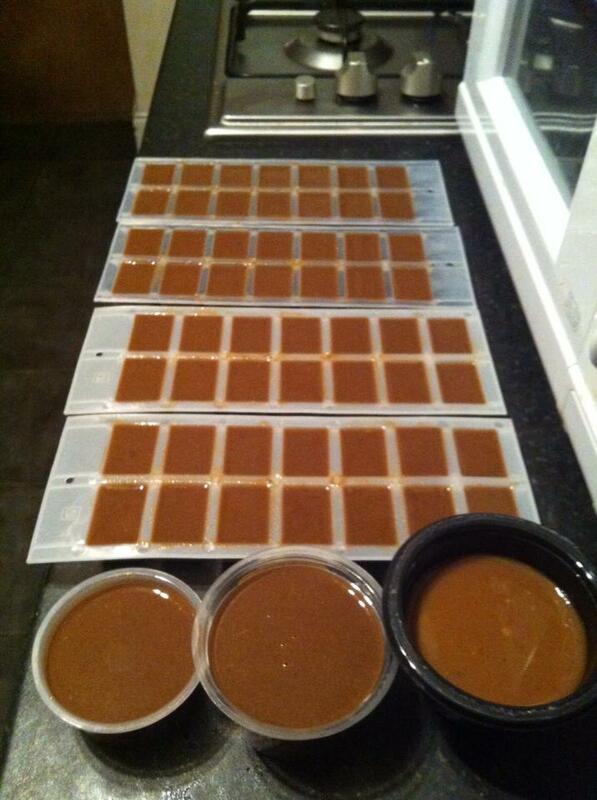 In ice cube trays or little plastic containers, ready to be frozen. These can make at least 30 plates of Hokkien Mee in the future, I estimate… Whoo! http://www.youtube.com/watch?v=HxX1thL0-kI my favourite stall in all of Singapore. I’m gonna pay a visit soon, you’re gonna have to sacrifice a cube or two for me muaha. Nam Sing!!! The last time I ate this I waited for more than 1 hour… Haha, my favourite is Geylang Lorong 29 (I’m a bigger fan of a slightly more wet Hokkien Mee). Love this recipe!! Can’t wait to try it, thank you!